Cistern installation - The Envisioning Phase: Due to frequent drought conditions in the area I live, I decided that a type of water reservoir system would not only be fairly easy to build, but it would help conserve water and save money. 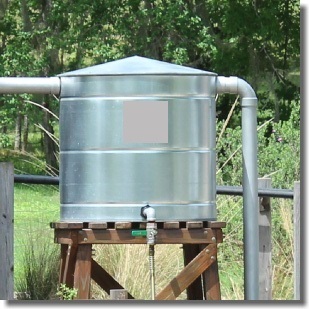 The easiest way to collect a significant amount of rain water is to add a gutter system to your home and collect the rain water that lands on your roof into a cistern or rain barrel. If you already have gutters installed, you are half way there! Once the gutters are installed, cistern installation is relatively simple. Place the cistern below a primary downspout to collect as much water as your reservoir will hold. Place the reservoir on blocks so that you can take advantage of gravity when watering your plants. Also, placing the reservoir higher will save your back from having to bend over to turn on and off the hose. You can also build a wooden platform out of pressure treated lumber or cedar to support your cistern. It will need to be strong enough so that when the reservoir is full, it can support the weight. The cistern size should be adequate to supply your water needs during extended periods of low rainfall (if you live in Texas, you know what I mean). Research Phase: Use the rainfall volume calculator below to determine how many gallons of water can be collected given the amount of rainfall and the area of catchment. The pitch of the roof does not play a part in the catchment area computation. It is the horizontal measurement between the roof's peak and bottom edge that is important. 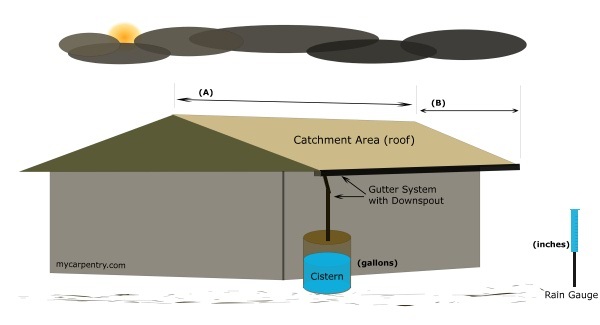 The diagram below shows one half of a simple gable roof as the catchment area. There is a gutter system on the bottom edge of the roof and a downspout on one end to direct water to the cistern. Enter the width and length (in feet) of the catchment area along with the amount of rainfall and press the calculate button. This will compute the gallons of water that will be captured in your cistern (or rain barrel) during a rain event.